"Everyone has the right to safety and security," SLC Mayor Ralph Becker says. Rick Egan | The Salt Lake Tribune Salt Lake City Police Chief Chris Burbank joins Transgender Education Advocates in conjunction with Equality Utah as he reads the names of those who lost their lives by acts of violence, during a candlelight vigil, Wednesday, November 20, 2013. Rick Egan | The Salt Lake Tribune Salt Lake City Police Chief Chris Burbank joins Transgender Education Advocates in conjunction with Equality Utah as he reads the names of those who lost their lives by acts of violence, during a candlelight vigil, Wednesday, November 20, 2013. Rick Egan | The Salt Lake Tribune Salt Lake City Police Chief Chris Burbank joins Transgender Education Advocates in conjunction with Equality Utah as he reads the names of those who lost their lives by acts of violence, during a candlelight vigil, Wednesday, November 20, 2013. Rick Egan | The Salt Lake Tribune Salt Lake City Police Chief Chris Burbank joins Transgender Education Advocates in conjunction with Equality Utah as he reads the names of those who lost their lives by acts of violence, during a candlelight vigil, Wednesday, November 20, 2013. Rick Egan | The Salt Lake Tribune Aisling Pompei (left) and Lea Fairbanks (right) light candles during the International Transgender Day of Remembrance program and candlelight vigil, Wednesday, November 20, 2013. 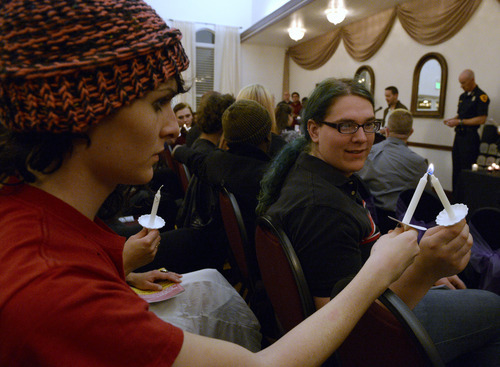 The mourners at Utah&apos;s Transgender Day of Remembrance were warned beforehand to emotionally prepare themselves. 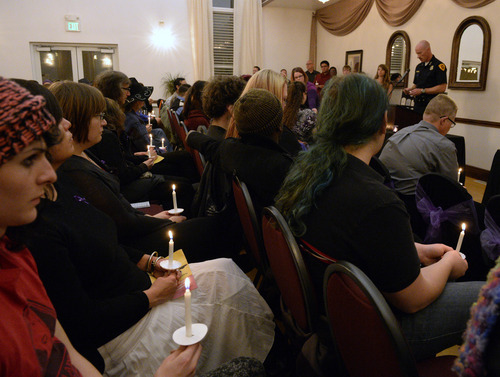 A list of brutal, fatal hate crimes against transgender people around the world likely would strike at very personal fears for many at Thursday&apos;s vigil in Taylorsville. "But for little more than luck, … many of our names could be on that list," said Dayne Law, board member of Transgender Education Advocates (TEA) of Utah. To hear the details of 180 homicides is upsetting under any circumstances. But the killings of transgender people recorded in the past year scraped depths of brutality, reaching "the level of &apos;overkill,&apos;" said Alex Miller, board vice president for TEA. Transgender people "aren&apos;t just murdered," Miller said. "We are disfigured and subjected to dehumanizing atrocities." As volunteers read details of each murder, mourners wept and hugged. These were not just shootings and stabbings. Many of the victims were tortured, killed in multiple acts of violence, and their bodies mutilated. 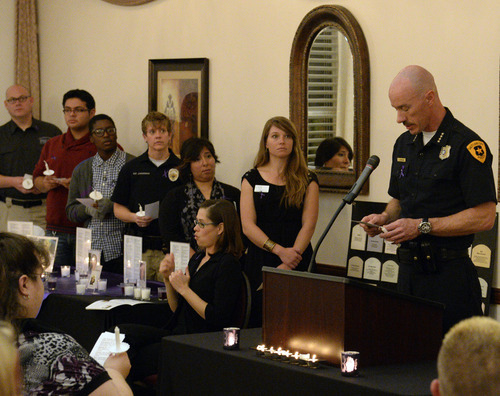 Some were killed by police or while in police custody  abuses made notable by the fact that many of the volunteer readers at this year&apos;s annual vigil were law enforcement officers. 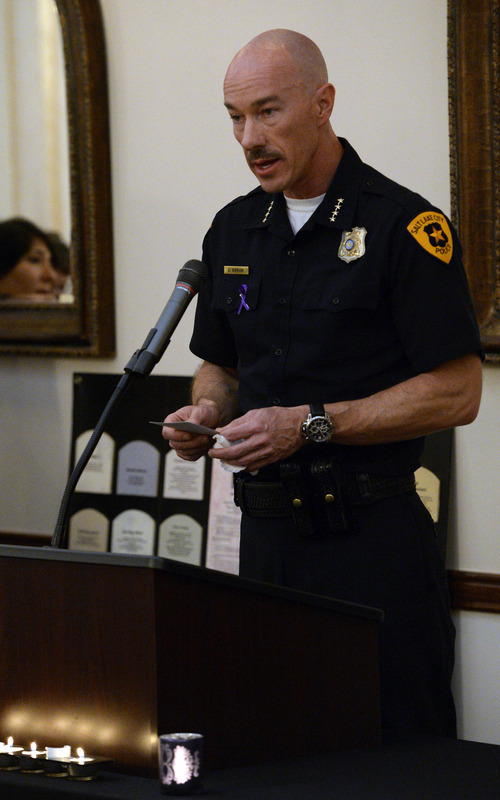 "It is unacceptable to think that loss of [even one] life is somehow OK," said Salt Lake City Police Chief Chris Burbank, keynote speaker at the event. Burbank said he hoped the traditionally rocky relationship between law enforcement and transgender communities could move forward. He thanked the vigil organizers for "the trust you are showing me in allowing me to stand here today." 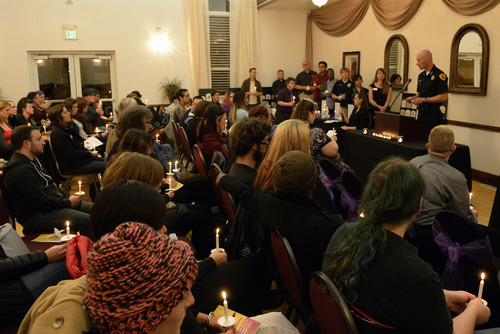 This year marks the 15th anniversary of International Transgender Day of Remembrance, and is supported by a Proclamation from Salt Lake City Mayor Ralph Becker officially making Sept. 20, 2013, the International Transgender Day of Remembrance. "Everyone has the right to safety and security," said Becker. "This vast, beautiful city of ours is one where each person deserves to be treated with dignity. We have a duty as members of a diverse and vibrant community to conquer our fears and recognize that every individual merits our respect." Cadence Metzler, TEA board president, said Becker&apos;s proclamation is the first time a city official in Utah has recognized the Day of Remembrance. "Such recognition has been difficult to come by," she said.